Yossi Sassi Band have released a video for their track Palm Dance. The song features on the ex Orphaned Land guitarist’s third album Roots And Roads which is out on May 25. 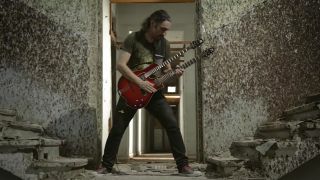 Palm Dance includes a guest appearance from former Guns N’ Roses guitarist Ron ‘Bumblefoot’ Thal. Last month, the group issued a stream of The Religion Of Music, featuring vocalist Zaher Zorgati of Myrath. Roots And Roads is available for pre-order.